BBC Television's Panorama programme has spent six months tracking illegal logs from the Congo rainforest to western Europe. The investigation has revealed that new EU timber regulations are failing to stop illegal wood getting into European stores. I have been on a stakeout for two days, but finally the moment I have been waiting for is about to arrive. I have been monitoring a ship carrying wood to Europe from Congo-Brazzaville. It is the dead of the night and I am at the port of La Rochelle on France's Atlantic coast. While its marina and pretty cafes make it a popular holiday destination, La Rochelle is also a major European gateway for West African logs. The logs on board were delivered shortly after the EU Timber Regulation came into force in March. Behind the regulation is a desire to end corruption, exploitation and create a sustainable rainforest logging industry. This high-risk shipment will test the promise to European consumers that the timber they buy is legally harvested. As dawn breaks, the cargo is unloaded and I can check the log markings that reveal which company felled the wood. The engravings show they are Okoume tropical hardwood trees from Banda Nord - one of two forest cutting zones in Congo-Brazzaville used by logging company Taman Industries Limited. But the markings appear to have been altered to change the zone of origin. Last year so many logs were shipped abroad that the government stepped in and imposed an export ban. The ban prevented the export of logs from 13 companies including from Taman's other cutting zone. But soon after, logs supposedly coming out of Banda Nord increased dramatically and were found with altered markings. The zone of origin had been changed. Taman said it was a mistake due to human error and paid a small fine. "Based on the sheer volumes that were coming out of Banda Nord we thought this doesn't seem right, it doesn't seem possible to be cutting that many trees," said Serge Moukouri, of Resource Extraction Monitoring, which has been observing the logging industry for the past seven years. They found timber harvested from Banda Nord had increased by nearly 500%. Their investigation concluded Taman was using the Banda Nord concession fraudulently as a front to illegally export thousands of logs which would otherwise have been part of the export ban. We asked Taman about the changed markings and whether the La Rochelle logs were part of a scam. They agreed the markings appeared to be changed and promised to get back to us with further details, but never did. 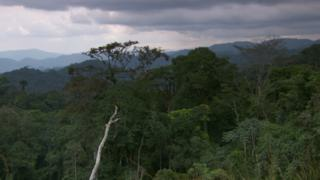 During a meeting they told Panorama: "I think there is nothing illegal from the Congo here. The exports are handled by... a branch of the Ministry of Forests. It is shown very clearly on the ticket on your logs that they are allowed to be exported." The forest monitors are concerned that the scale of illegality committed by Taman did not trigger an investigation into the La Rochelle logs by the European authorities and importers. "I think that enough information was out there to raise enough doubt that at the very, very, least more in-depth investigation should have been done by the importer to access the risk," said Brad Mulley, country co-ordinator at Forest Monitors. We tracked down the importer of the logs. Edwood is one of La Rochelle's biggest timber importers and is managed by Fabrice Gautier from a small office close to the port. Under the new EU laws it is their responsibility to ensure the timber has been sourced and imported legally. We contacted Fabrice Gautier a number of times, but many questions remained unanswered. He would not tell us how he could be sure the logs were legally sourced. We asked Taman what checks Fabrice Gautier had made about the logs they supplied. They told us he was given proof of their licences to cut and export timber. But under the new regulations he should have done much more. "Under the new EU timber regulations the import of this timber into France should have raised a red flag, this is at the very highest risk of what these timber regulations are about. And the operator who was importing the timber should have been held to account," said John Sauven, executive director of Greenpeace UK. "It's absolutely urgent that France does set up a proper body to deal with it because if France or other countries don't participate properly and effectively in the European timber regulation then of course it will weaken it and it won't work in the way that it was set up to do". You can watch Panorama - Jungle Outlaws: The Chainsaw Trail on Thursday 25 July at 19:00 BST on BBC One and then on the BBC iPlayer in the UK.